A creamy & comforting homemade corn casserole often makes an appearance alongside a pot of hearty chili or as a classic side dish for the Thanksgiving dinner table in our home. 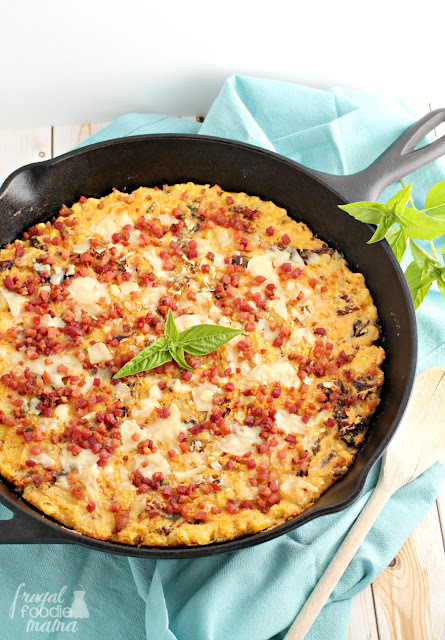 Usually we stick to a tried & true corn pudding type casserole for the fall time, but this year I decided to kick up this family favorite side dish just a notch with some classic Italian flavors like crispy pancetta, shaved Parmesan cheese, sun dried tomatoes, and a little fresh basil. 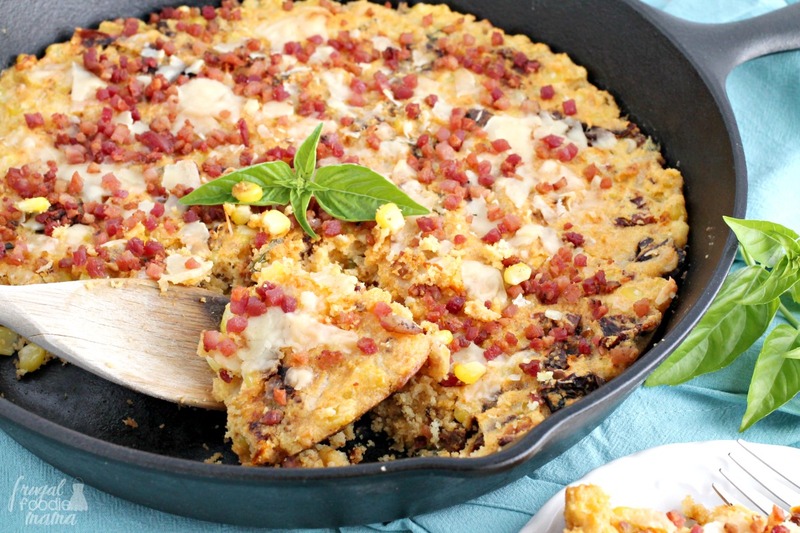 This Italian Style Corn Casserole is sort of a cross between a corn pudding and a cornbread. Definitely creamy, but it holds it shape when you dish it out and doesn't spread all over the plate like some corn casseroles do. 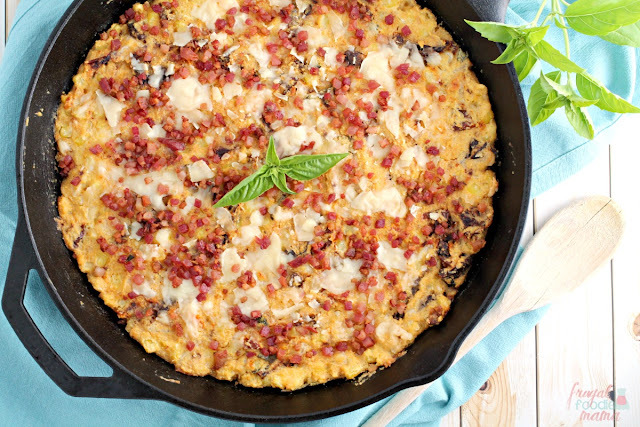 The flavors in this casserole are what really make this side dish stand out. The salty pancetta paired with the sweet corn and the creamy Parmesan cheese with the slight tang from the sun dried tomatoes? Corn casserole heaven, folks. 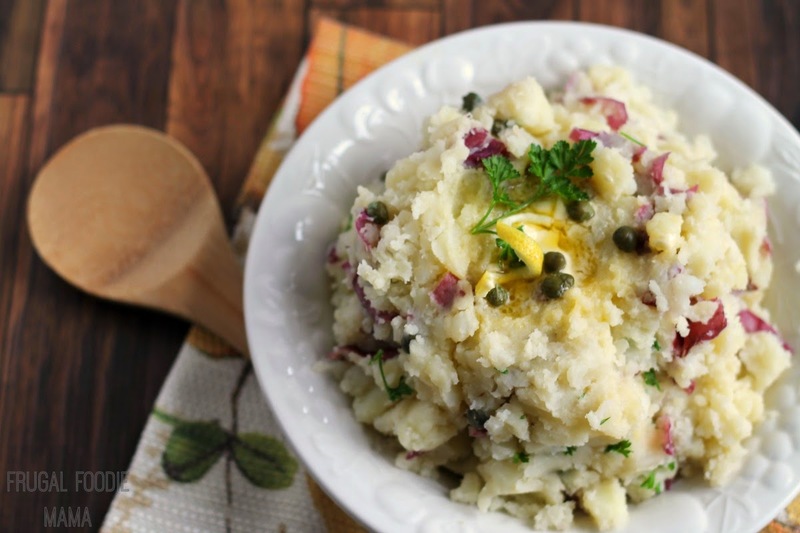 While this tasty Italian twist on a family favorite side will definitely be making an appearance on my Thanksgiving dinner table in a couple of weeks, I have a feeling that my family will be requesting this one for years to come. ;) Can you really blame them though? Preheat your oven yo 425 degrees. Heat the olive oil in a 12 inch cast iron skillet. Once heated, add in the diced pancetta and cook until browned and crispy, about 5 minutes. Transfer the pancetta from the pan to to a paper towel lined plate using a slotted spoon. Set aside. In a large mixing bowl, whisk together the instant polenta, baking powder, and salt. Add in the eggs, sour cream, and heavy cream and mix well. Fold in the corn kernels, chopped basil, sun dried tomatoes, and 1/2 cup of Parmesan cheese. Spread the batter evenly into same the skillet you used to crisp the pancetta. Top with the browned pancetta and the remaining 2 tbsp of Parmesan cheese. Bake for 25-30 minutes or until set and lightly golden brown around the edges. 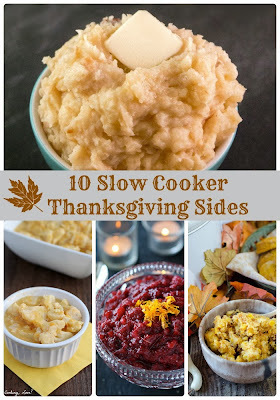 Allow to cool for 5-10 minutes, and then serve. I know this that Italian Style Corn Casserole is going to go fabulous with that roasted turkey for Thanksgiving, but I also think it would be pair perfectly with a bowl of my Italian Style Red Wine Chili. 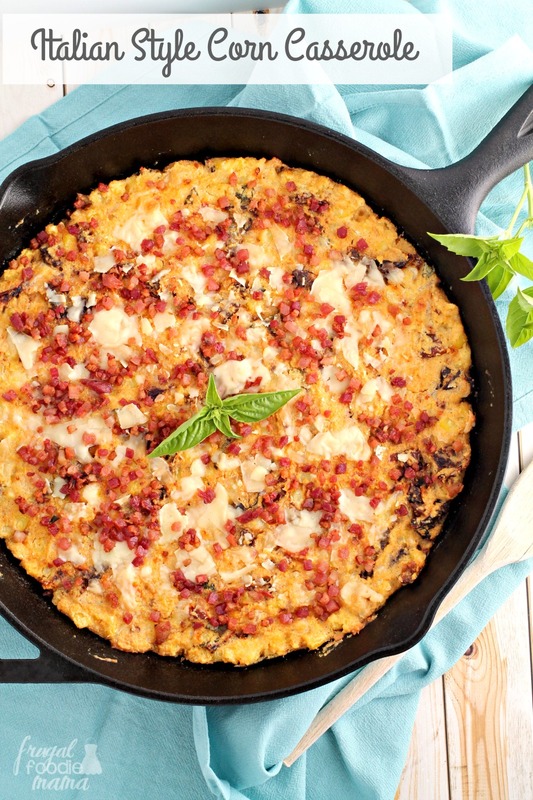 What would you pair with this tasty Italian twist on a classic corn casserole?